Twig Terrariums are an easy way to help bring nature inside. Just place out of direct sunlight, mist every few weeks, and watch as your terrarium thrives. Each design comes ready-made and includes charming figurines. What’s so special about a glass vessel, a pile of rocks, some plant life, and a little figurine or two? We’re not exactly sure where the magic comes from, but the combination is totally endearing. Maybe it’s the tiny people. 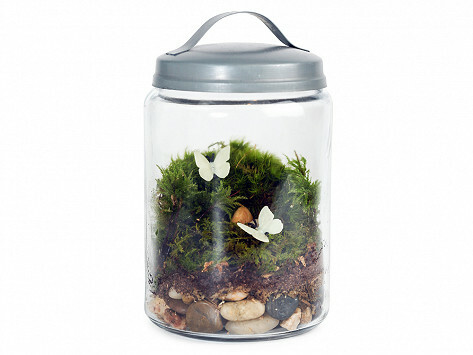 They make it easy to imagine that the idyllic world created inside each moss terrarium is real. The creators of these precious worlds are two longtime friends, Michelle Inciarrano and Katy Maslow. They turned their love of terrarium-making into a business after realizing they each had about 50 terrariums in their houses and perhaps ought to find new homes for their work. The miniature people are their signature. Each kit from Twig Terrariums contains everything you need to make your own little green world, complete with inhabitants. (Or if you’re not the DIY type, you can choose a ready-made style.) We tried it, and it’s a fun, therapeutic activity. The instructions are easy to follow, and maintenance is a breeze, too, since the terrariums don’t require a lot of attention. They don’t require a lot of light either which makes them the perfect cheery addition to any room in your home or office, even the windowless ones.